My apologies, but handing in job applications and seeing Michael Pollan (!!!) at the West Roxbury Branch Library got in the way of my posting the past few days. I promised that I would talk about some of the advantages and disadvantages of the continuous brewing method, so here it goes. -Because you are drawing off how much KT you would like to drink/bottle each day, and because the SCOBY is constantly in the same container, the amount of time you need to sanitize the equipment/area is significantly less. This will save you time and decrease the chance that your SCOBY will become contaminated by mold (even though contamination by mold is rare, anyways- next post!). 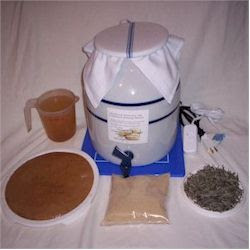 -According to Happy Herbalist, the continuous brewing method produces the "fullest most complete range of beneficial nutrients available at any one time." -Kombucha researcher Mike Roussin indicated that some beneficial acids do not even appear until 14-21 days of fermentation (1). However, there are several CONS to the Continuous Brewing Method. 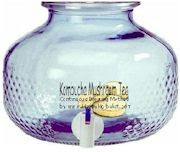 -Maybe the continuous brewing vessels sold on kombucha websites are specifically designed to avoid this problem? (They are $, however). -Some people say to "pick your poison," plastic or metal. You won't be producing any more kombucha babies by this method, which may or may not be desirable. I also don't know how long SCOBYs live- some say 8 cycles, some say they last for months- it will depend on many factors. But case in point: kombucha mushrooms do not live forever. 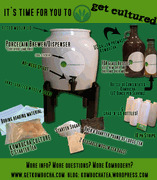 If you would like to read another take on the Continuous Brewing Method, look here. And remember- whether you decide to use the Continuous Brewing Method or brew the typical way, it all just depends on you and your lifestyle! I've never tried it, but I think you'd be able to do that. In any case, it's worth a shot!